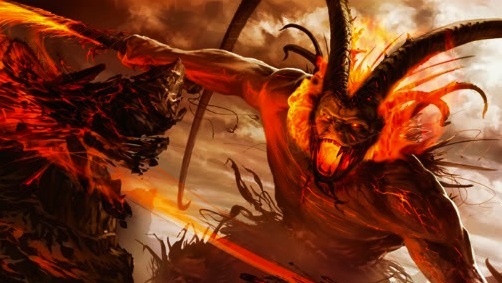 Surtur is a fictional (Character) demon that appears in comic books published by Marvel Comics, usually as a villain in stories featuring the Norse hero Thor. Based on the fire giant Surtr from Norse mythology, and was adapted by writer Stan Lee and artist Jack Kirby, and first appeared in Journey into Mystery (October 1963). The character was once described as one of "The Ten Most Heinous Enemies of the Mighty Thor"...More about Surtur (Marvel Comics) Character Review - keep reading !! 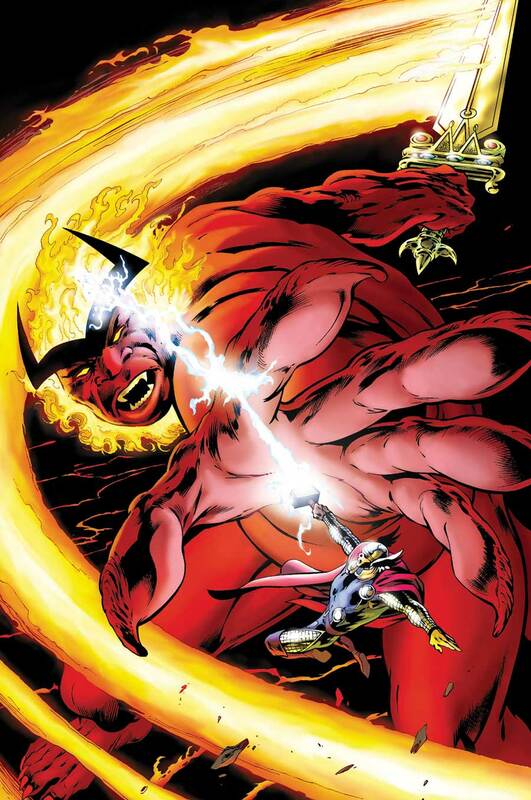 Surtur was depicted as an immense and malevolent elemental fire demon whose power was of apocalyptic proportions. Standing over 1,000 ft. in height, Surtur possessed strength and durability by far surpassing that of Thor; the ability to generate intense heat, flames or concussive force; molecular manipulation such as transforming his fingers into serpents; levitation and inter-dimensional travel. Surtur's scale of power is usually shown to equal that of Odin. He is a skilled warrior and swordsman, and has a prehensile tail. He possesses a great intellect, and has vast knowledge of ancient and arcane wisdom. He is vulnerable to intense cold, and can be imprisoned by certain magical spells or by other beings wielding cosmic energy powers equaling his own. 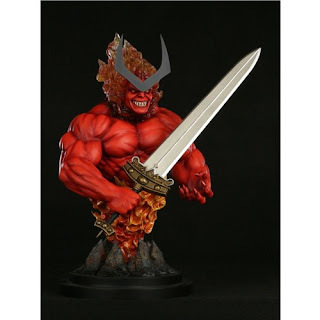 Surtur possesses the giant sword Twilight, also known as the Sword of Doom, composed of a god-like metal known as Scabrite, which can only be found in the mines of Sutur's realm. The sword is magical, capable of manipulating vast amounts of mystical energy, such as shattering dimensional barriers and inhibiting Odin's powers. Loki has temporarily tapped into the power of the sword to change Thor into a frog (Thor is normally resistant to this type of magical transformation) and making the Asgardian populace sick (Asgardians are normally immune to disease). Morgan Le Fay tapped into the power of the sword to reshape the entire planet Earth from modern day into a medieval world after using the chaos magic of the Scarlet Witch to "bridge the gap" between her personal faerie powers and the Asgardian magics bound to the blade. When the sword is bonded with the Eternal Flame, its powers are further increased to an unknown level. The Eternal Flame has an unknown connection to Surtur. When in its vicinity, Surtur claimed it increased his powers. It is unknown to what extent this power increase leads to. In Thor: Tales of Asgard, Surtur's sword "Elderstahl" is the focal part of the story. Surtur is seen in flashbacks in Jotunheim battling Odin over the fate of the Nine Realms. 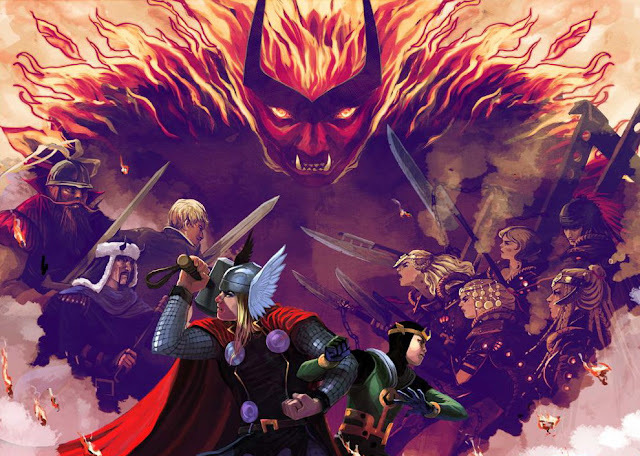 In the Marvel animated feature Hulk Vs Thor segment, Surtur makes a brief cameo at the start of the film as one of the enemies attacking Asgard during the Odinsleep.